As the sweat drips from my temple, it's hard to imagine that this is the first day of fall. After all, the leaves on the trees are still fresh and green, the grass is lush and monarchs flit through the air. With the 90F temperatures, bright sun and recent rain that has allowed the summer flowers to finally blossom, Missouri seems like a pleasant oasis right now. Soon, though, they'll be migrating south to avoid our frigid winters. You can see it in the light yellow leaves that confetti the ground of a nearby tree, the fall blossoms nearing the fence line and the slight chill in the otherwise humid air. Autumn is near. Yes, near, but not quite here. While today is the first day of fall, the equinox doesn't officially occur until 8:54 pm tonight. The equinoxes are two scientifically-observable times of near-equal night and day that occur in the spring and fall, marking the beginning of each season. They're holidays of balance, asking us to look inwards towards what we are grateful for and what we need to let go. In the spring, we celebrate growth and new goals. In the fall, we celebrate closure and gratitude. A harvest festival, we often show our gratitude by large feasts with friends and family, earning this holiday the nickname of the "pagan Thanksgiving." For this altar, no non-natural items were used but I did purchase this beautiful red apple at our local farmer's market. Apples are a common sign of the autumn equinox as they're the main harvest of the holiday. They're also commonly associated with knowledge and wisdom, between folklore and their timely gifts to teachers as children begin school. By placing this apple at the center of my altar, I wanted to surround it in a way that emphasized this theme of wisdom and knowledge. 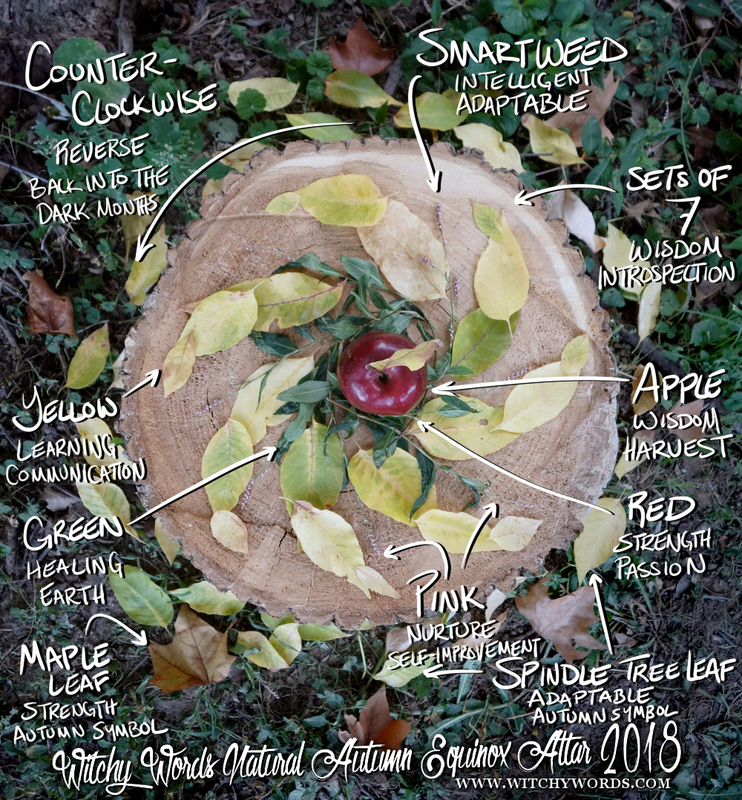 Around the apple, spiraling outward, are the yellowing leaves of a spindle tree. Spindles are decorative European trees often used here in US landscaping for their beauty, making them adaptable. They're particularly relevant to autumn because, once the air grows cooler, they produce gorgeous red-orange berries, setting the landscape ablaze. These berries aren't edible - in fact, they're quite toxic - but its beauty is what makes this tree so desirable in suburban lawns. Spindle trees are thus adaptable and beautiful, but the yellowing of their leaves is of particular interest. Yellow is the color of learning and communication, again going back to the theme of wisdom and intelligence on this altar. Also spiraling out from the apple are these small pink flowers called smartweed. Everything you need to know about smartweed's associations are right in the name: The sprawling vine represents intelligence and adaptability, playing right into the theme of the altar. On the altar is a theme of seven: Seven arms of spindle leaves and seven smartweed flowers. In numerology, seven is the sign of widsom and introspection. I spun the pinwheel spiral counter-clockwise to represent our fall back into the darker months, linking the altar back to the holiday at hand. Finally, at the bottom of the altar, I placed an array of spindle leaves mixed with the few maple that I could find in my yard. Maple trees are a common sign of autumn because their leaves turn all shades of yellow, orange and red, a magnificent display for the time of year. Maples are also a sign of strength. Any kind of intellectual pursuit takes determination and mental strength, and these leaves dropped in here and there represent just that. Overall, this altar is an ode to introspection and wisdom. As we turn to the darker half of the Wheel yet again, we turn inward, examining our goals and preparing for the cold months ahead. At such times, wisdom is key. The intelligence to prepare, the knowledge of exactly what to do and the wisdom to look ahead are important factors. Our children are in school, adult classes begin and the season of learning returns. I'll leave you with a visual dissection of the altar. Enjoy! Another well thought out altar. Hope you had a lovely equinox!